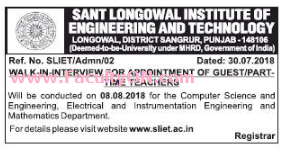 Sant Longowal Institute of Engineering and Technology, Punjab has advertised in THE HINDUSTAN TIMES newspaper for the recruitment of Teaching Faculty- Guest / Part-Time Teachers jobs vacancies. Interested and eligible job aspirants are requested to walk-in on 08th August 2018. Check out further more details below. About College: Consequent upon the decision, taken by Govt. of India in 1985, to tender a valuable, yet humble tribute to the everlasting memory of the revered saint, Sant Longowal Institute of Engineering and Technology took its shape. The institute was established by Ministry Of Human Resource and Development (MHRD), Govt. of India in the year 1989 and was formally inaugurated on 20th December 1991. For Engineering Departments: The candidates with B.E / B.Tech and M.E / M.Tech with 1st class in both, in the appropriate branch of Engineering / Technology. Candidates with higher qualifications will also be considered. For Science / Mathematics Department: B.Sc / M.Sc with 1st division in appropriate discipline of Sciences with NET qualified. Salary Package: Rs.1000/- per lecture to a maximum of Rs.25000/- per month. How to Apply: Interested and eligible candidates are requested to attend the Walk-in interview along with complete bio-data filled in prescribed format, originals & copies of certificates and recent passport size photo to the walk-in address given below.